How to Determine Boys' Jeans Size? 1. Measure around the natural waistline: The waist is usually just above the belly button (narrowest part of torso). Still not sure where the waist is? Stand in front of a mirror, and bend to one side. The waistline is simply where you can see a natural indentation in torso on this side. Take a relaxed measurement, and keep the measuring tape parallel with the floor. Use waist measurement and body height measurement to determine jeans size in the size chart below. This method is most accurate. 2. 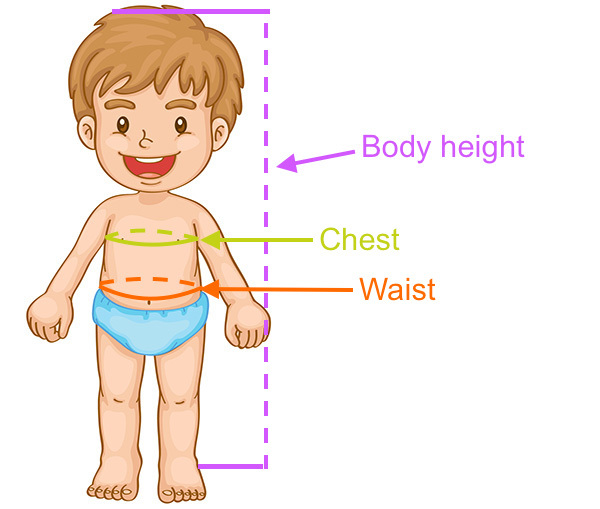 Determine jeans size based on boy's age: Determine jeans size from size chart below based on age. Easy-to-use method, but it is not very accurate. There are different boys' size types. "Slim" jeans are made for slim/skinny boys. Look for "slim"/"slim fit"/"skinny fit or "S"" on the jeans' size label. "Regular" jeans are ment to fit "average" body type. Look for "Regular" or "R" on the jeans' size label (or no information about size type on label). "Husky" jeans are for more rotund boys. Look for "Husky" or "H" in the label. Your Boy - Size and Age? How accurate are these boys' jeans size charts? Help us (and others) know by leaving the jeans size and age of your boy below. Thanks!